The biggest airship in the world, an amazing structure which is veritably a flying battleship, is practically finished and ready for test flights by the U. S. Navy, The man who supervised the design of this warship of the sky reveals here the fascinating mechanical details of its construction. ABOUT the time this article appears in print the largest lighter-than-air ship ever built—the 6,500,000 cubic feet Akron will be walked out of the world’s largest airship dock, or hangar, for its initial trial flight. When the Akron takes to the air, the dream of Count Zeppelin—a super-airship capable of taking its place in world commerce—will have been realized. Not that the Akron is such a ship, for it is purely a military craft, a sort of flying battleship, built for scouting work with the fleet at sea, but it contains within it all the essentials which the coming trans-oceanic air liners will need, save actual passenger compartments. 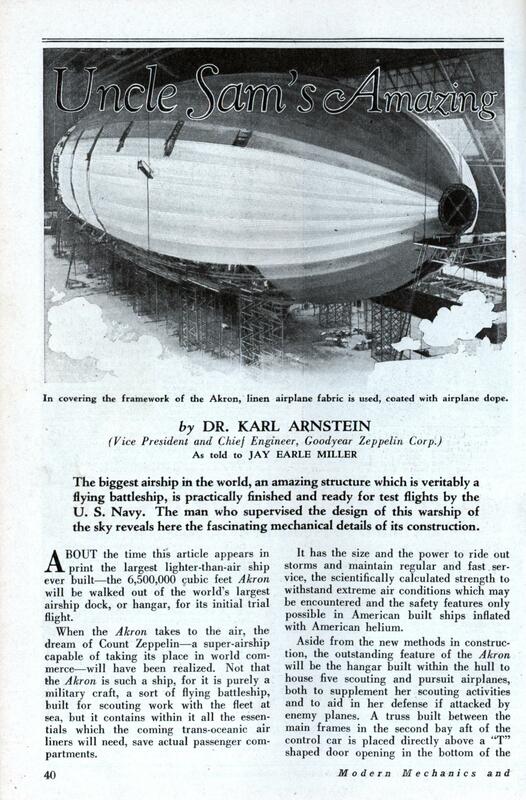 It has the size and the power to ride out storms and maintain regular and fast service, the scientifically calculated strength to withstand extreme air conditions which may be encountered and the safety features only possible in American built ships inflated with American helium. Aside from the new methods in construction, the outstanding feature of the Akron will be the hangar built within the hull to house five scouting and pursuit airplanes, both to supplement her scouting activities and to aid in her defense if attacked by enemy planes. A truss built between the main frames in the second bay aft of the control car is placed directly above a *T” shaped door opening in the bottom of the fabric covering. Through this opening a trapeze will be lowered, and the airplanes, with a hook above their upper wing, will fly up and make contact, as has been done many times in experiments with the Los Angeles. After they have attached themselves the planes will be drawn up within the hull and hung up in storage from the supporting truss. The airplane compartment, 75 feet long and 60 feet wide, will provide space for five airplanes. Airplanes and armament are to be provided by the navy department, but the original plans called for gun nests in the nose and tail, on top of the hull above the control car, in either side amidships, and in the leading edge of both the vertical stabilizing fins, above and below the hull. The lower fin also is to contain an emergency steering station for use in event of the failure of the cables from the control car. Provision also is made for one or two basket cars, which may be lowered by cables from the ship, flying above the clouds, per- mitting observers to be lowered below the clouds, from where they can direct operations by telephone. The ZRS-4 (the official designation of the ship pending her launching and naming) is one of two sister ships ordered by the U. S. Navy department from the Good-year-Zeppelin Corporation of Akron, Ohio, and the name selected for the first one built is a tribute to its birthplace. In size, which, in lighter-than-air ships means lifting gas capacity, the ZRS-4 and ZRS-5 will each be nearly twice as large as the Graf Zeppelin and considerably more than two and a half times as large as the Navy’s Los Angeles. The latter has a gas capacity of 2,470,000 cubic feet, the Graf Zeppelin has 3,700,000, and the two American ships will each contain 6,500,000 cubic feet of lifting gas. They will be about 35% larger than the 5,000,000 cubic foot R-100 and R-101, built in England. Despite the vast increase in size, the Akron is only 15 feet longer than the Graf Zeppelin, but 34 feet greater in diameter. Those dimensions, 785 feet long by 132.9 feet in diameter, makes the Akron a fatter, more rounded ship, a contour that has marked advantages. The slim lines of the Graf, the Los Angeles and the German war-time Zeppelins, were not dictated by aerodynamical considerations so much as by limited hangar space in which to build them, and, in the case of the “lead pencil” shaped wartime ships, considerations of quantity production. Volume for volume the surface of a fatter ship offers less frictional resistance to the air,, but the greater diameter causes an increased form drag. Tests have shown that the advantages of fatness reach their height in comparison to the disadvantages of form resistance when the length is somewhere between five to seven and a half times the diameter, so the fineness ratio of the ZRS-4 of 5.9 comes well within those limits, and is much superior to the 7.7 ratio of the Graf Zeppelin. The outstanding features of the American ships, however, is a vastly improved form of construction made possible by their size, and the elimination of exterior power cars in favor of engine rooms built within the hull, made possible by the use of non-explosive, inert helium gas instead of the dangerous hydrogen. To understand how we have improved the form of construction it is necessary to consider the evolution of the Zeppelin design. Airships built to Count Zeppelin’s triple layer principle—which means a series of separate gas cells, a rigid framework to confine them and support the load, and an outer covering to protect the other members against the weather and furnish a smooth flying surface—fall naturally into three classes, which might be called small, medium, and large ships. The Bodensee, built at Friederichschafen in 1919 for passenger purposes, is typical of the smaller class, the Los Angeles, built in Germany for the U. S. Navy of the medium type, and the new naval ships are of the larger type. In the smaller class the hull is a series of main transverse girders, rigidly braced within their plane by a system of cross wires, holding together all the corners. One of these main girders or rings is placed between each pair of gas cells, and they are joined by longitudinal rib girders, which in turn are strengthened by intermediate rings between the main girders. In the Bodensee the main rings were seventeen-sided polygons, with from three to four bracing wires extending from each of the corners where two sides were joined. One of the seventeen sides was placed horizontally at the bottom to form the floor of the corridor. In the Los Angeles the main frames were 22-sided polygons, developed from regular 24-sided figures by extending the second sides from the bottom downward until they met. Because the angles between two sides were quite obtuse, and a wire-braced figure with such angles and so many sides would be too sensitive, each pair of sides was braced with a simple diamond truss, and the alternate corners, at the truss ends, wire braced. The wire bracing in the n^ain frames of a Zeppelin serves two purposes. It braces and strengthens the girder rings, and it also acts as a bulkhead to retain the gas cells in place. But when one gas cell is partially deflated the adjoining cell presses the wire bulkhead outward, and thus exerts a considerable strain on the girder. In the new American naval ships we have adopted a new form of construction, with main girders inherently strong and requiring no wire bracing. A wire network of somewhat different pattern is used, but it is fitted somewhat loosely so that it may give under the pressure of the gas cell without exerting a strain against the framework. The new type of main girder consists of three rings, two equal to the outer diameter of the ship at that point, and the third, somewhat smaller, mounted within the hull and braced in a zigzag fashion with truss members to form a ring with triangular cross section. The triangle within the three rings is large enough to hold a corridor, and each of these main frames contains a catwalk and ladder system extending entirely around the ship, so that members of the crew can reach any point. Next, instead of placing a keel at the bottom, we have three keels extending the length of the ship, one at the top and the other two on either .side, about 45 degrees from the bottom. The framework of the three keels and the similar framing of the main transverse members forms a rigid whole, which requires no wire bracing. Between the main rings the usual intermediate girders are placed, to carry the ends of the short lengths of longitudinal ribs, and help confine the gas cells. There is a fourth keel, within the bottom of the hull, extending from the control car forward to the mooring mast door in the nose. Our ability to place the eight 560 h.p. Maybach engines in roomy engine rooms within the hulls, made possible partly by the use of inert helium and partly by the location of the side corridors, is one of the most interesting developments in the new ships. It eliminates all air resistance from exposed power cars, it gives us roomy engine quarters in which a complete overhaul can be undertaken, if necessary, while in flight, it gives us a simple form of geared propeller arrangement which makes possible slower and more efficient propellers, and, finally, the fact that the propellers are driven by bevel gears at the ends of the outboard shafts, makes it possible to swivel the propellers around through 90 degrees of arc. Thus, by utilizing the reversible feature of our engines, we can direct the propeller blast downward to increase the lift of the ship, or we can turn it upward to force the ship downward without the valving of the precious helium gas. The bevel gearing at the end of each transmission shaft is enclosed within a spherical housing, which in turn is built within an outer, streamlined cover, which, with the streamlined cover over the transmission shaft, is rigidly attached to the hull and braced with suitable struts. On the inner spherical housing there is a worm wheel, the worm of which is turned by a shaft terminating in a hand wheel within the engine room. As the worm is self-locking it is easily set and remains fixed in any position. The new ships are equipped with a water recovery system which extracts water from the exhaust gases to replace the weight of the fuel consumed—an important feature, as otherwise a ship becomes lighter in flight, and it would be necessary to valve lifting gas to compensate for the weight of fuel consumed. A peculiar thing about the water recovery system is that it sometimes extracts more water from the exhaust than the weight of fuel burned, the recovery under certain conditions of temperature and humidity being as much as 140%. As a result we can not only replace the lost weight of fuel, but actually put water back into the ballast bags to replace that used in maneuvering. In the Akron we pre-cool the exhaust gas before it reaches the water vapor condensers, which are set flush with the hull, with only thin longitudinal ribs projecting. A cold air intake leads up over the exhaust manifold, surrounding the exhaust stack. Above the engine there is a blower, driven by a belt from the main transmission shaft, the blower providing circulation for the cooling air. In cold weather the heated air from the blower is piped to the control car and crew’s quarters to warm them. Another new thing about the Akron is that it is the first airship to be built independently of the beef steak and roast beef consumption of the country. In the past the gas cells of a Zeppelin have been lined with goldbeaters skin, a thin gas tight material taken from the intestines of steers, and in a ship the size of the new air giant it would take millions of steers to provide the vast quantity of skin required to line the twelve huge gas cells. But we have developed at Akron a new gelatine-latex process by which a gelatine coating is attached to the gas cell fabric by a rubber latex binder, the material being evenly spread by mechanical means. With the old method each small piece of skin, rarely larger than a square foot had to be cemented in place and rolled down by hand, which made gas cell building a slow and costly process. The new cells are not only practically as light as skin lined bags, but cost less and, tests have indicated, will stand up better under handling, particularly in cold weather, when skin-lined cells are quite fragile. Many people have the idea, because airship building in America has been devel- oped by a rubber company, that the fabric covering of a Zeppelin is a rubberized cloth. It is not. Putting the covering on the ZRS-4 is very much like covering an airplane. The same sort of cloth is used, the panels, stretching from rib to rib and from transverse girder to girder, are laced in place, the joints covered with tape, and the cloth is then “doped” with a cellulose dope to shrink and stiffen it. After several coats of dope the surface is lightly sandpapered to make it smooth, and a final coat, in which is mixed aluminum powders, added. The final coating of metallic paint increases the waterproofing, and also turns back most of the sun’s rays—which is important as heat expands and wastes the lifting gas. In connection with waterproofing, much has been printed in the newspapers of late regarding the possibility that rain soaked up by the hull covering or adhering to its surface may have been responsible for the tragic loss of the R-100 a few months ago. It is possible that moisture had something to do with that disaster, but not in that way. Investigation shows that a film of water one one-hundredth of an inch thick, covering as much as 80% of the ship’s surface, would not have weighed more than six tons, that the impact force of falling rain on the R-100 could not have struck a total blow in excess of 300 pounds, and that total saturation of the fabric could not increase its weight more than six percent over its weight when perfectly dry. As there is no such thing as dry fabric in normal practice at least one-fourth of this latter item would already be taken into account in planning the ship. It is possible, as Dr. Eckener has pointed out, that the gas cell lining may have failed because the cement used was not moisture proof, that water may have entered in quantities through bow openings, and that in a violent effort to lift the ship’s nose tears in the forward gas cells may have been ex- panded into great rents. The loss of the British ship, it seems certain, was primarily due to novel features of her construction, the previously untried gas cell cement, and the political conditions which dictated her fatal trip under unfavorable circumstances. Two companies, the Pacific Zeppelin and the International, have been organized to investigate and plan regular commercial air lines across the Atlantic and Pacific oceans. In planning the construction hangar for the navy ships we built it large enough to house the construction of thousand foot, ten million cubic foot capacity commercial liners. That size is rather larger than will be needed, perhaps. Somewhere between six and eight million cubic feet may be the ideal size for hundred passenger commercial ships, equipped with all the luxuries of an ocean liner, plus the absence from noise, vibration and seasickness, and with the great speed which only the air can offer. With four to six such ships regular air service could be maintained on an economical basis, spreading all the overhead cost of terminals, ground crews, traffic department and other expenses over the operation of the entire fleet, instead of making one ship bear it, as has been the case with the Graf Zeppelin. That would mean appreciably lower rates for passengers and freight, no higher, perhaps, considering the speed and other advantages, than those charged on the crack ocean liners. The measures pending before congress providing for air mail contracts on trans-oceanic routes will, if they pass, remove one great obstacle in the way of the creation of such a super-airship line, and make the early inauguration of such a service almost a certainty. This is what we need to patrol our southern borders. Except that the Akron and it’s sister ship, the Macon were lost to crashes in bad weather. But with today’s more accurate weather forecasts, thanks to computers and satellites, it should now be possible to bring back the dirigible! Unexpected high winds should be a thing of the past! And, possibly for very short hops on land, this might indeed be reasonable. But I would not want to rely on the improved quality of today’s weather forecasts to decide that it is now safe to slowly cross the entire width of the Atlantic with a dirigible. They haven’t improved that much. In 90 years Goodyear has only had three crashes in its fleet. Dirigibles were hugely complex structures. Work out the linear length of just one the massive ring trusses used in building a dirigible some time and then compare that with commercial radio antennas or crane booms. And a dirigible used dozens of ring trusses. What hasn’t been pointed out is every airship built was in essence it’s own prototype. Unlike heavier than air aircraft that had as many a half dozen to a dozen prototypes then a initial manufacturing run during which corrections to design problems are addressed, dirigibles were made in very small numbers often only one of a type. The only lighter than aircraft manufactured in significant numbers were blimps and barrage balloons. When you’re talking about a design using new alloys, new building techniques and having unknown handling characteristics, is it any wonder they failed in service especially when computer simulations were non-existent? Hell, one dirigible was destroyed because the hanger/shed design caused massive wind effects when the dirigible was removed from the shed. Dirigibles failed because of a lack of design data and a lack of flight experience. Is that such a surprise? 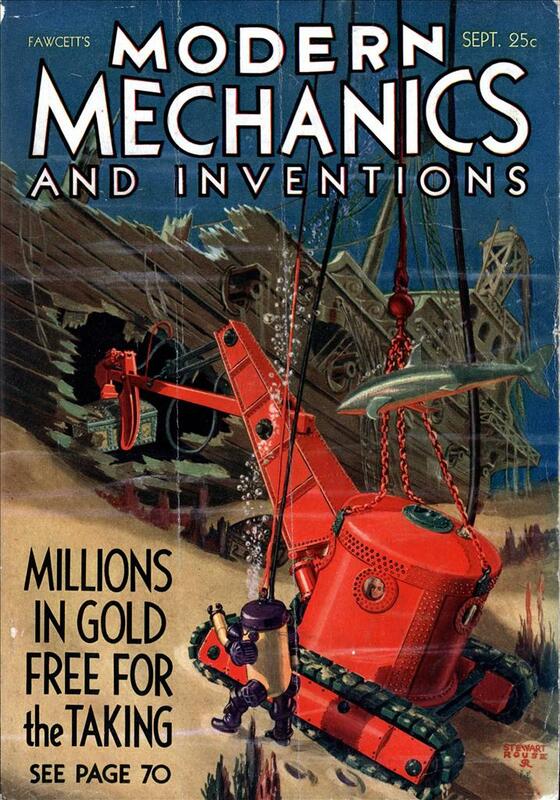 Of course, if only the prototype was made, this may be due to some other problem with dirigibles. Until there is a sound economic niche for that type of craft, there won’t be enough demand to make more than one of a kind. New niches are being explored for LTA craft of all sorts and attracting investor money. There’s some pretty wild schemes up to and including minimizing logging roads by using LTA craft to transport individual logs to centralized transport hubs with waiting trucks. Then there’s the rather silly banana boat blimp concept to bring bananas / farm products from the interior of countries with bad or non-existent road systems out to ship ports and rail heads. Currently, the plans I’ve seen for dirigibles and large blimps are either sensor platforms that can loiter for long periods [one LTA craft can do the job of several UAVs which have to be refueled / maintained more often and carry a smaller radar or other sensor system]. Or for aerial cruises similar to what cruise ships offer. They certainly can supplement cruise ships now for small, select passenger lists and can go where cruise ships can’t – over land. I can see them combined with eco-tourism replacing to some extent hot air balloon excursions and helicopter tours while acting as hotel rooms. And their air speed is enough to make traveling long distances not untenable especially with the notoriously bad roads some undeveloped countries have. It’d be amusing if they replaced buses for touring pop music bands, promotion and transportation in one unit. Get the band to the city, then cruise around advertising the event. I suspect that LTA craft will be used for cargoes that are more urgent than what ground / sea transport can handle and less urgent than fixed wing aircraft can offer. And they might be utilized by companies wanting to appear more ‘green’ than their competitors. These “Warships” also made for huge targets for AA guns and Air-to-Air weapons. So they were, at best, good Sub Spotters, but useless for any other tasks. They weren’t really effective, but to a pilot there is nothing cooler than an air aircraft carrier.